Convenient food doesn't have to ruin your diet. You can eat healthy McDonald's fast food meals under 500 calories if you know how to navigate the menu. Use this guide to find out which is the most healthy McDonald's food item to choose, which foods to avoid, and how to combine different menu items so you can enjoy a low-calorie McDonald's meal without suffering dieter's remorse. McDonald's and many other fast food restaurants post calorie counts for each of their food products. But if you are in the drive-thru lane you might not have time to grab your calculator and do the math. So be safe and stick to sandwiches that include grilled meat or chicken to keep the calorie count low. You'll also boost your daily protein intake with those choices. It's also a good idea to skip the French fries and choose fruit instead. If you want to indulge, get a small size of fries and choose a smaller sandwich. And your best bet for saving calories? Skip the soda! Get water and add lemon to make the water taste better. The best way to stay healthy at McDonald's is to order a la carte. That means you bypass the popular Value Meals and only order the menu items that you love so you don't waste calories on foods you don't need. A 4-piece order of Chicken McNuggets provides 180 calories, 11 grams of fat, 10 grams of protein and 11 grams of carbohydrate. The more popular 10-piece order of Chicken McNuggets provides 440 calories, 27 grams of fat, 24 grams of protein and 26 grams of carbohydrate. Double those numbers for the 20-piece chicken nugget calories and nutrition. 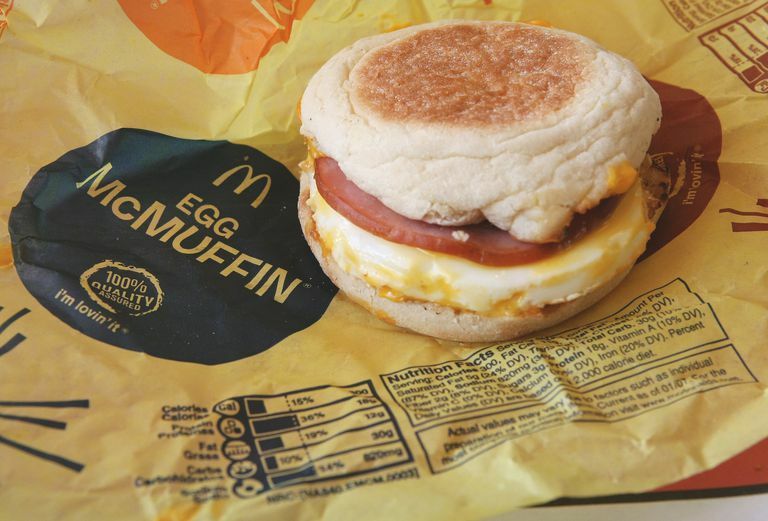 An Egg McMuffin provides 290 calories, 12 grams of fat, 17 grams of protein and 29 grams of carbohydrate. A McChicken sandwich provides 350 calories, 15 grams of fat, 14 grams of protein and 40 grams of carbohydrate. A Quarter Pounder with Cheese provides 540 calories, 27 grams of fat, 31 grams of protein and 42 grams of carbohydrate. A Filet-O-Fish sandwich provides 390 calories, 19 grams of fat, 17 grams of protein, 38 grams of carbohydrate. A Cheeseburger provides 300 calories, 12 grams of fat, 15 grams of protein and 33 grams of carbohydrate. If you choose to enjoy your meal with one of McDonald's popular sweetened drinks, you'll have to add more calories. A large McDonald's Sweet Tea contains 160 calories and a large Coca-Cola contains 300 calories. There are some items that are lower in calories. Depending on the meal you choose to enjoy, there are several different ways to enjoy a full meal for under 500 calories. There are some items you should avoid if you are watching your waistline. Most dieters will visit McDonald's for their popular lunch or dinner burgers and fries. So can you enjoy these popular favorites and still keep your weight loss program on track? Yes! Just stay away from the super-sized items and high-fat condiments like mayonnaise and cheese. As you might expect, the fries won't do wonders for your diet. An order of large French Fries contains 510 calories, 24 grams of fat, and 66 grams of carbohydrate. And you might also want to avoid the Double Quarter Pounder with Cheese which will add 780 calories and 45 grams of fat to your daily total.